At the end of WW2, in 1945, the Bristol Aircraft Corporation considered getting into the car business. The company’s skilled workforce had spent six years building aircraft and the firm approached the Aldington brothers of Frazer Nash about a joint program. The brothers had sold BMWs under license before WW2 and the two companies agreed to collaborate. In 1945, H.F. Aldington was still in the British Army. He visited the bombed-out BMW factory in Berlin and came away with plans, engines and Chief Engineer Fritz Fiedler. The factory was in the American zone and everything was supposed to be sent to the U.S., but the plans and materials were declared war reparations, and stayed in England. The 404 2+2 coupe arrived in late 1953. Called the “Businessman’s Express”, it was shorter and lighter, with 110 mph top speed. A full-width body abandoned the aerodynamic look and the BMW engine was tweaked to 105 hp. 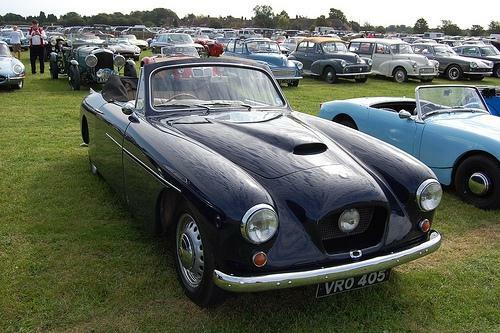 Only 52 were sold from 1953-56, and at least one drophead was built by Abbott. Succumbing to the 4-door diversion to which all sports car makers succumb, Bristol’s next move was the interesting 405 saloon of 1954. A surprising 265 were sold by 1958, along with 56 pretty dropheads. Some saloons were also bodied by Beutler in Switzerland.